As another La Nina weather pattern becomes a stronger possibility, forecasters with the Climate Prediction Center - part of the National Oceanic and Atmospheric Administration, which also oversee the National Weather Service - have revealed their thoughts about the coming winter season. There is a 55 to 65 percent chance that La Nina conditions will develop, in which ocean waters become cooler than normal. "If La Nina conditions develop, we predict it will be weak and potentially short-lived, but it could still shape the character of the upcoming winter," said Mike Halpert, deputy director of NOAA's Climate Prediction Center. 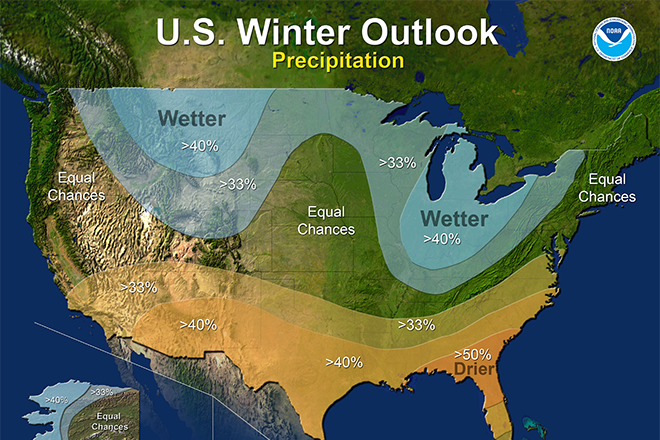 "Typical La Nina patterns during winter include above average precipitation and colder than average temperatures along the Northern Tier of the U.S. and below normal precipitation and drier conditions across the South." For much of Colorado, that could mean a warmer than average winter. In most of the state, chances are greater than 40 percent that temperatures will be above normal. There is a 1 in 3 chance that northeast Colorado will be warmer than average. Chances for average moisture are about equal for most of the state, though there is a 33 percent chance northwest Colorado will see a wetter winter than usual. While the outlook offers insight into the potential for overall climate variations from seasonal norms, weather conditions will still be highly variable across the country, and cannot be predicted with accuracy beyond a few days or a week. For example, snow forecasts typically cannot be predicted more than a week in advance since they depend upon the strength and track of specific winter storms. 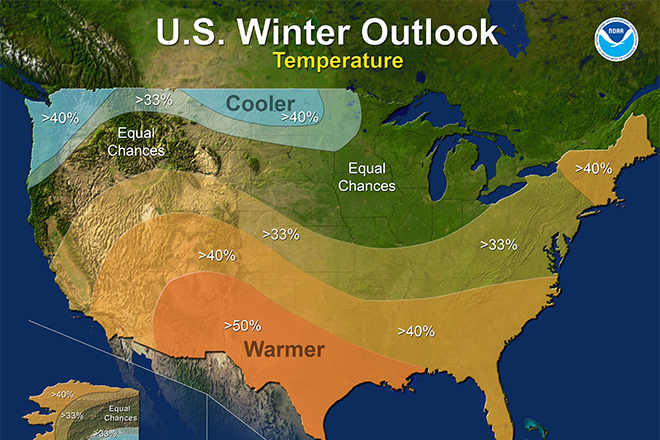 Seasonal outlooks are updated each month to reflect the best available information at the time.